Normally, seeing Myst mentioned as an inspiration to a game quickly turns me into a grumbling old man reminiscing of the past. Naturally, my memories are likely to be skewed and largely mislead by now, mostly tinted by a nostalgic shade of a time when I witnessed the best looking water ever (hello 90s), or when I was amazed by the sheer amount of secrets a world within a video game could hold. Well, I’ll probably never witness those exact things again, but a certain game on Kickstarter that goes by the name of Zed might actually be able to bring back the feeling of solving obscure puzzles while trying to figure out a story told by hidden diagrams and awkwardly placed pots. The fact that its development is headed by a man who’s worked on the original Myst can only make things better (despite that not guaranteeing a solid design due to most of his credits involving art work and whatnot). As it stands, Zed’s premise is quite vague; it looks like you get to play in a dream world situated within a man’s “disintegrating mind”, that being translated into screenshots showing cities corrupted by vegetation and clockwork structures strewn across dying trees. 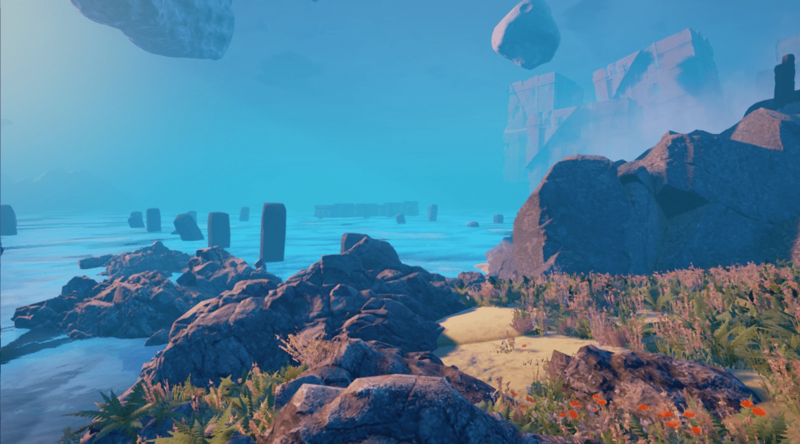 In other words, much like in Myst games, Zed seems to be heavily reliant on environmental hints when it comes to solving puzzles and figuring out the world’s general rules. Visually, the game also looks faithful to many quest games of this nature, with plenty of M.C. Escher-inspired architecture and otherworldly-looking colossal buildings floating by. Naturally, those mostly seem to be accompanied by lots of levers, switches, buttons operating intricately built conveyor systems and other means of oddly constructed machinery. There’s no wonder the Kickstarter campaign mentions curiously chipped bricks as prime examples of puzzle clues. Then again, we shouldn’t really be expecting anything else from a game of this nature. While we might have passed the times of obscure and difficult to recognize interactions being designed solely for the sake of making experiences longer, Zed would only benefit from intricate (and furiously difficult) puzzles that might take hours to solve. In fact, I’m kind of glad we’re seeing a game that attempts to present a more mechanics-driven experience, especially since challenge in so many recent narrative-based first-person games can be boiled down to one’s patience and determination when it comes to walking slowly. It’s also interesting to note that despite Zed’s humble Kickstarter goal of $48,000, the game is being developed by quite the big team (that is, in comparison to other games with similar goals on the platform). The exact number is twelve, and it includes lots of names with plenty of industry experience under their belts. With a demo being available and looking pretty stunning already, I would lie if I said I wasn’t excited for more. Or, you know, that could just be the nostalgia kicking in.